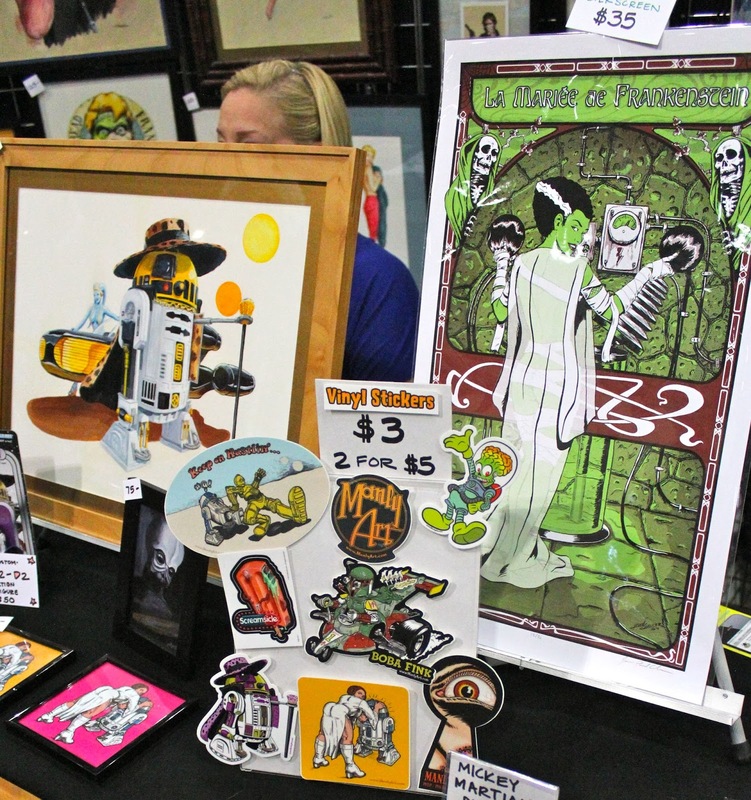 Comikaze Expo's third year has come to pass with another amazing year in seeing how fast Los Angeles' very own Pop Culture Convention continues to grow in size and popularity. We as toy and comic collectors had our minds set on purchasing a few Stan Lee's Comikaze Expo exclusives and items from artists we hoped to meet. 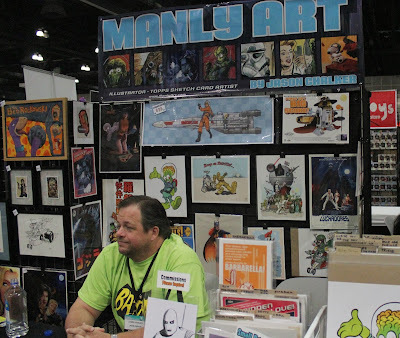 One of the booths we were definitely targeting would be Manly Art, Jason Chalker's booth. 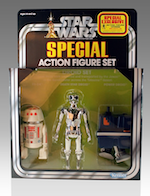 We would have to meet Jason Chalker and look for the one figure I was after, Pimp2-D2. 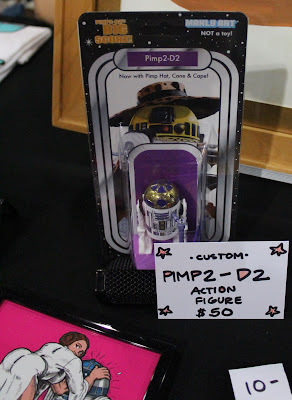 We first learned about Pimp2-D2 from New York Comic Con. Jason Chalker released the Pimp2-D2 in a very limited run on a Star Wars style Early Bird card. He mentioned that it was a very limited run that he sold out of very quickly and saved a few for friends. Even Seth Green had to pick one up at New York Comic Con. Jason Chalker is a great guy who definitely has a love for Star Wars as you can see in his works. He has worked as a Topps Sketch Card artist for Mars Attacks and Star Wars. 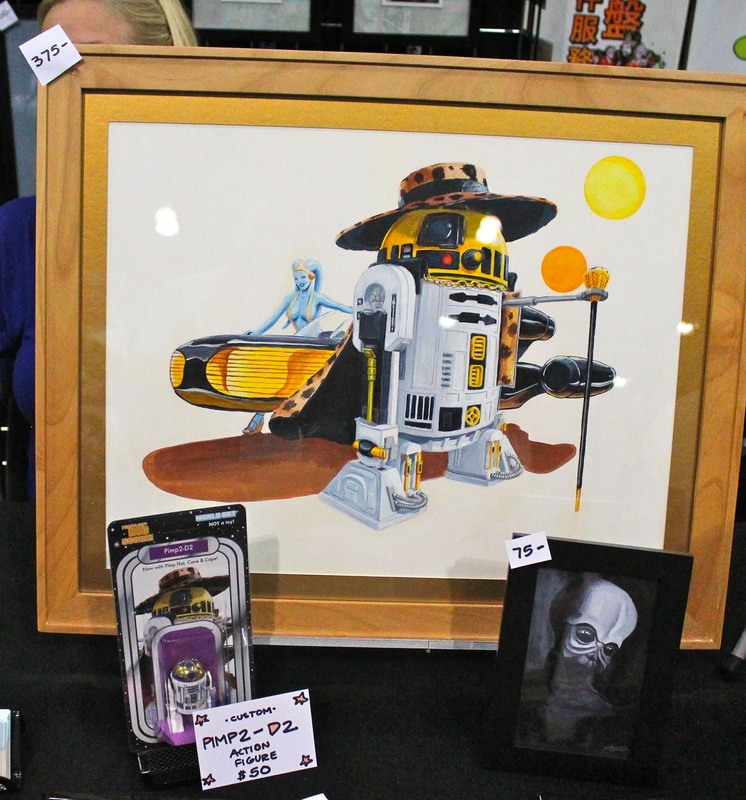 He also created a piece for Designer Con 2013 in DKE Toys, 99 Deaths of Jar Jar Show featuring many incredible artists. 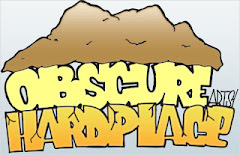 Here were a couple of shirts that he had available and has available on the Manly Art site. He had his Mickey Martian and Boba Fink t-shirts available. 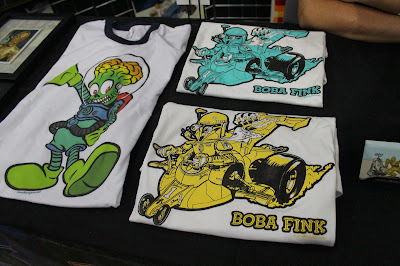 We loved Chalker's Boba Fink shirt that has the Ed Roth's Rat Fink style with everyone's favorite Star Wars Bounty Hunter. We actually scored a shirt by doing a trade for a Boba Fink shirt for our "Day of the Dead Koala" shirt! 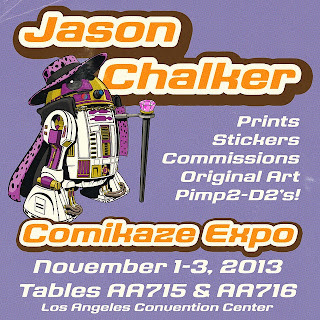 And there it was, the original art for Jason Chalker's amazing creation of Pimp2-D2 along with the Pimp2-D2 figures that he had an extremely limited run available at Comikaze Expo. He would then be in my grasp! 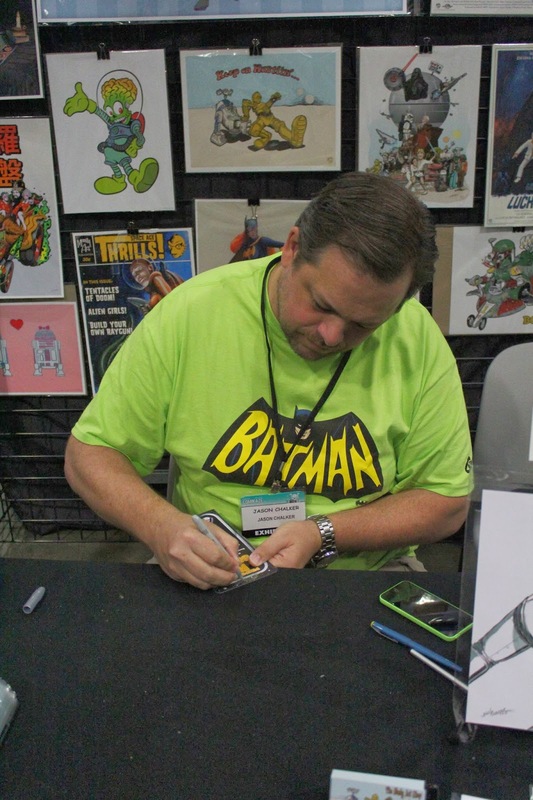 Jason Chalker signing my Pimp2-D2 figure. It was great to meet Jason Chalker at Stan Lee's Comikaze Expo. We had great talks throughout the weekend. 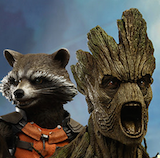 Definitely became an instant fan of his works and look forward to what he will be creating next. 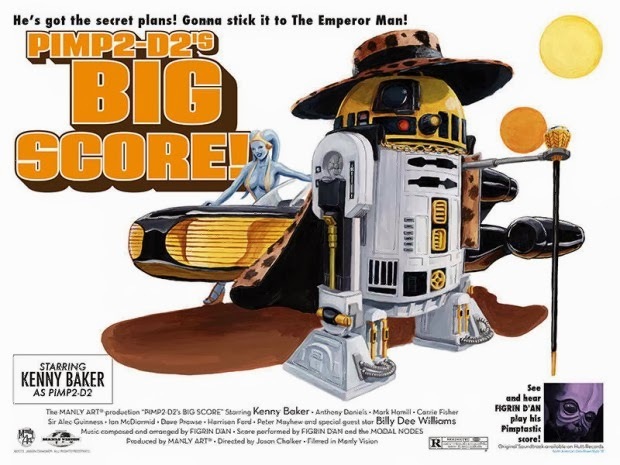 Stay tuned for our review of Pimp2-D2!